I have climbed lots of peaks and on quite a few occasions been to the top of mountains with two summits of apparently similar height. On more than one occasion I've stood on one summit and looked over at the other and said "that ones higher".... only to walk to the other summit, look back and say... "no, that ones actually higher" One occasion recently we were all convinced the other summit was higher, but measuring with the GPS it was 5m lower! How can this be? I think the explanation for this phenomenon is that your eye is drawn to the horizon and believes this to be on the "level". If the summit you are looking over at sticks above this "level" then logically it should be higher. However the horizon when viewed from a high mountain is not actually "level". Typically in the Andes you might be standing on the summit of a 6000m peak that rises above the altiplano, a high plateau at generally 4000-4500m. As you can see in the diagram, this gives the effect of the horizon being approximately 1º below a "level" eyeline (given the assumptions about distances etc. made in the diagram). This diagram does not take into account the curvature of the earth, which over a distance of 100km would add approximately another 1º to the effect, dropping the horizon still further below the line of what is actually level. Hualca Hualca 6025m in Peru. There are many reports about which summit is higher. Because they are about 1km apart and at over 6000m, not many people visit both. We climbed the central peak in 2015, which seems to be the one most often recorded as the highest, but the eastern peak looked to be very similar in height, and I can see why people climbing it might think it was the highest. Cordon de los Pioneros, near Bonete, Argentina. (p.6152m and p.6240m) We made first ascents of two 6000m peaks here in November 2011, and on both of them there were two high points separated by about 100-200m. So we visited both summits of both peaks, and saw this phenomenon on both. Laguna Blanca, 6012m, Argentina. There are two summits, a southern one, with a large Inca platform on it and a northern one, about 800m away, which is the highest point. This was where the 2006 summit record from the first modern ascenscionists was stashed as well. GPS measurements gave a height difference of about 10m, although this was not apparent to the naked eye. The Argentine 1:100,000 IGM map has the 6012m spot height on the northern summit. 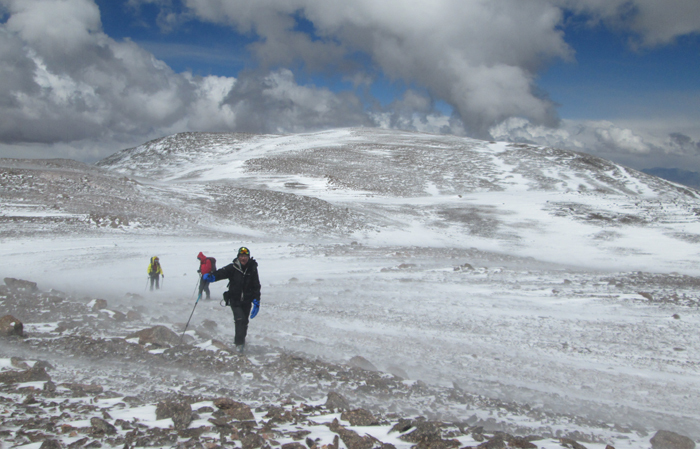 On recent 2017 and 2019 trips to the Chilean Puna we have climbed two peaks that displayed this phenomenon, Cerro Colorados, 5180m, above the east side of the Salar de Maricunga, and Cerro Santa Rosa on the southwest side of the same Salar. Both had summits separated by 50-100m where it seemed that whichever one you stood on the other looked higher! Laguna Blanca south summit from near the top of the main summit.